The festival of Durga Puja starts with Mahalaya, the first phase of the waxing moon in Aswin. Thousands offer prayers to their ancestors at the city's river banks, this ritual is called Tarpan. The inauguration of the Goddess idol starts on Mahashasthi. The main puja is for three days - Mahasaptami, Mahaastami, Mahanavami. The puja rituals are long and very detailed and complicated. Three days of Mantras and Shlokas and Aarati and offerings - needs an expert priest to do the Puja. Because of these facts, the number of Pujas held in the family has reduced and Durga Puja has mostly emerged as a community festival. Saptami is the first day of Durga puja. Kolabou or Nabapatrika is given a pre-dawn bath. This is an ancient ritual of worshiping nine types of plants. Turmeric plant " Halud Gaach"
Wood apple tree " Bel Ghaach"
Pomegranate tree " Daalim Gaach"
The nine plants of Nabapatrika represent the nine Goddesses. The Banana plant or the "Kola Gaach" represents Goddess Brahmani, Colacassia plant represents Goddess Kalika, Turmeric plant symbolises Devi Durga, Jayanti denotes Kartiki, Bel or wood apple Goddess Shiva, Pomegranate (Dalim Gaach) Raktadantika, Ashoka tree symbolises Sokrahita and Arum plant ("Maankochu") represents Chamunda and the Rice plant Goddess Lakshmi. These Goddesses are the nine forms of Devi Durga. In the early hours of Saptami, the twigs of white "aparajita" plant along with nine bunches of yellow threads are used to tie the Nabapatrika. It is then bathed. In our scriptures the elaborate bathing ritual of nabapatrika is compared with the coronation of a King. Just like the King is bathed with waters from holy places and oceans, bathing nabapatrika too requires the same. All the nine Goddesses representing nabapatrika are bathed with waters from 8 different holy places. This bathing ritual is accompanied with varied mantras and diverse musical instruments for different goddesses. (*bathing rituals). The main Saptami Puja follows Kalparambho and Mahasnan. The day begins with a recital of Sanskrit Hymns in community Puja Pandals as thousands of devotees offers Puspanjali to the Goddess. 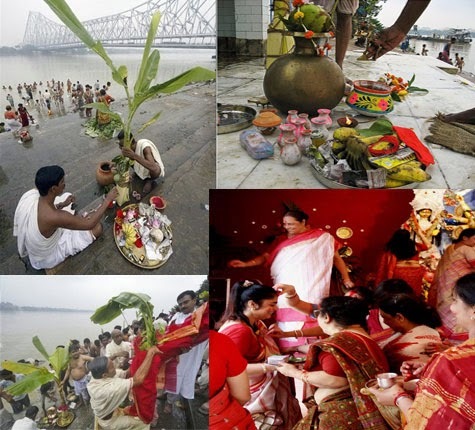 Kumari Puja or the worship of little girls as the mother goddess is a special part of the rituals performed in a number of traditional and household pujas. As the day passed on, it was time for the important Sandhi Puja, which marks the inter-link of the Maha Ashtami and Maha Navami. : An integral and important part of Durga Puja, Sandhi Puja is performed at the juncture of the 8th and 9th lunar day. Sandhi puja lasts from the last 24 minutes of Ashtami till the first 24 minutes of Nabami. During this juncture (the "Sandhikhan"), Durga is worshipped in her Chamunda form. Devi Durga killed, Chando and Mundo, at the juncture of the 8th and 9th lunar day, known as "Sandhikhan" and thus acquired the name of "Chamunda". After the three days of Puja, in Dashami , in the last day, a tearful farewell is offered to the Goddess. Most of the community pujas postpone the farewell as long as possible and arrange a grand send-off. The images are carried in processions around the locality and finally is immersed in a nearby river or lake. Vijaya Dashami is an event celebrated all over the country. It's also one of the events on the day of Dashami. After Ma Durga is immersed married Bengali women apply vermilion to each other. The custom of observing Durga Puja Fast is particularly prevalent in Northern India. In the state of Punjab people observe fast for seven days of the nine-day-long Durga Puja Festival. The fast is broken only on the ashtami or navmi day. Some devotees of Durga Ma consume only milk during the fasting days while some only live on fruits. Some devotees observe ‘Ekana’ which means that they take one complete meal during the day. Non-vegetarian food, intoxicating substances and other forms of entertainment are completely avoided during the fasting days. Men observing fast are not supposed to shave. Some also believe in sleeping on the ground and thereby deny themselves all luxuries and comforts. Fasting during Durga Puja festival is also quite popular in the state of West Bengal and several other Southern states. At the end of the fasting period devotees feed beggars and worship little girls who spell the Shakti of Mother Goddess. At several places there is a tradition of sowing barley seeds during the Durga Puja fasting period. In this a small bed of mud is prepared in a little container and barley seeds are sown in it. This is placed in the Puja room and cared for during the fasting period. At the end of the fast the shoots reach a height of 3-5 inches. These are pulled out and given to devotees as form of blessings.